These pages bring updates and news about Foodary Facts Category. This covers anything that doesn’t really fit into any individual category, or has yet to be assigned. There is a simple calculation for acid and alkaline foods that can measure your pH balance diet score. However, like many things that are simple, there is more to the pH balance calculation than meets the eye. pH balance is the overall balance between acid and alkali (base) in the human body, as measured by the alkalinity of urine. pH (powers of hydrogen) is a specific scale showing acid or alkaline properties. 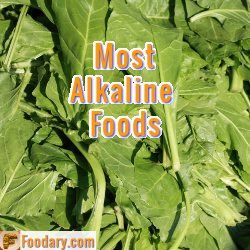 The alkaline vegetables list follows on from my earlier Acid-Alkaline Vegetables and Vegetable Products Food Chart. I describe the improvements in Alkaline Food Lists Explanation, which you can read now, or click into from the help links in the list below. According to the latest advice from nutrition experts at Harvard, vegetables should form about one third of all we eat. This is measured by energy (calories), and so I list all foods in units of 100 calories. On a daily basis, you should therefore consume 600-700 calories from the vegetable list below. Please note that I have limited the initial list to vegetables included in the USDA key foods. If you need additional foods in the list, please ask at the help desk. Energy defines the quantities in a healthy diet, but there are many factors that define quality. Ultimately, diet quality depends on your personal needs. That is why I am driving Foodary towards providing personal healthy eating plans. Prior to that, I want to go beyond basic acid-alkaline information. I have extended PRAL from earlier food charts, which measures acid/alkaline forming foods. I have added fiber, sugars, and sodium, as these are common factors that affect your health. Alkaline food lists are nutrition statements for key foods from the USDA database. I’ve called the new tables lists to distinguish them from earlier versions that I called Acid-Alkaline Food Charts. The data is from the same source, the USDA nutrition database, but I’ve reduced the number of items and increased the amount of nutritional information. Eventually, the data will form the heart of an interactive healthy recipes system. I’ve introduced these new changes to encourage debate about what are the most important aspects of eating for health. A fixed weight makes it very difficult to compare different food items. Some items have an overwhelming number of variations, and many obscure items are completely unknown to most people. Reducing the list to less than 600 key foods will inevitably exclude some foods that many people need to analyze. As I identify those, I will add extra items to the lists. You can request your own items on the eating for health forum, or the Foodary Facebook page.